A few years ago I came across an Alton Brown diatribe against one-use kitchen gadgets (or “unitaskers,” I think he calls them) and thought it would be a good rule not to buy them for our New York kitchen. This more or less worked (mostly thanks to B2 putting his foot down on random Amazon purchases and the fact that we just had no room, lest we start storing kitchen appliances in our bathroom) but I also pretty much immediately found ways to bend the rule, i.e. the SPAM slicer is okay because it can also slice tofu, and the potato ricer can also make excellent pumpkin puree — clearly bi-taskers! And then, in a fit of indulgence a few months ago, I bought our very first waffle iron. This is arguably the largest unitasker to grace our kitchen. But I calculate that a waffle iron is actually at least a penta-tasker (quintup … tasker? ): (1) waffle pizza! (2) waffle grilled cheese! (3) waffle-ninis! (4) all kinds of actual waffles! And, now, (5) stuffing waffles! The thing is, if I used the waffle iron to make only stuffing waffles, I’m pretty sure it would still be worth it. 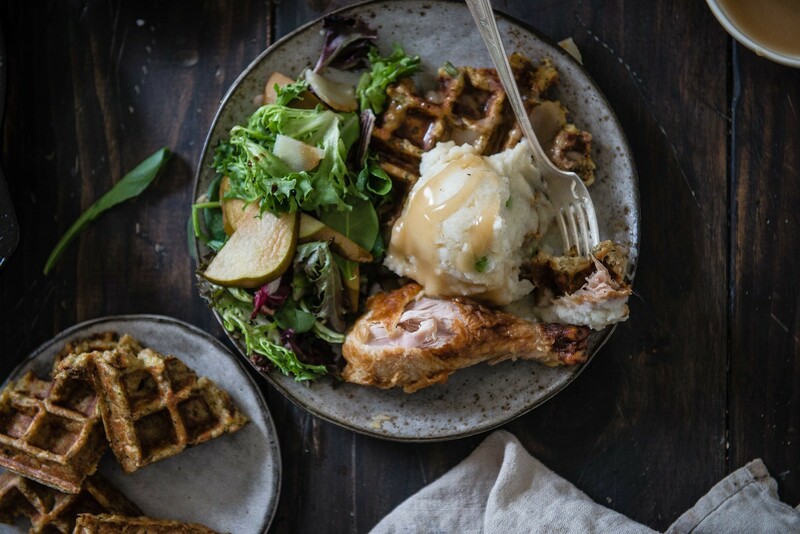 After seeing them crop up in all sorts of places online, I’ve been waiting to make these for all the years that our kitchen was too cramped to fit a waffle iron, and they lived up to every expectation: All the intensely savory, buttery, carb-tastic goodness of my very favorite Thanksgiving side dish is stuffed into a sizzling iron and made delightfully crispy on the outside, but fluffy and almost creamy inside, ready to tuck all the other Thanksgiving leftovers, from mashed potatoes to turkey to cranberry sauce, into its perfectly square divots. (And I added maple syrup, because why not.) 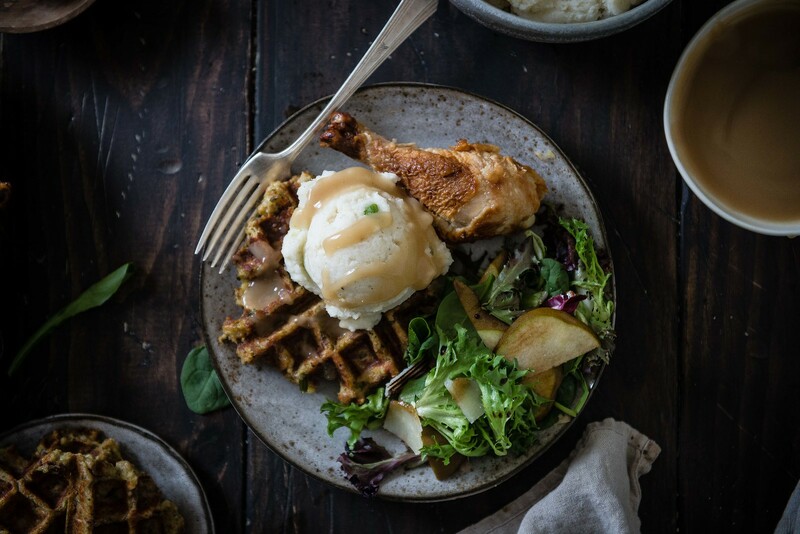 I can think of no better way to reheat stuffing the next day — and in fact, it’s good enough that I’d be happy to make stuffing just to waffle. After a tumultuous couple of weeks, wishing you all a safe, happy Thanksgiving. Thank you so much for being here, and for reading! 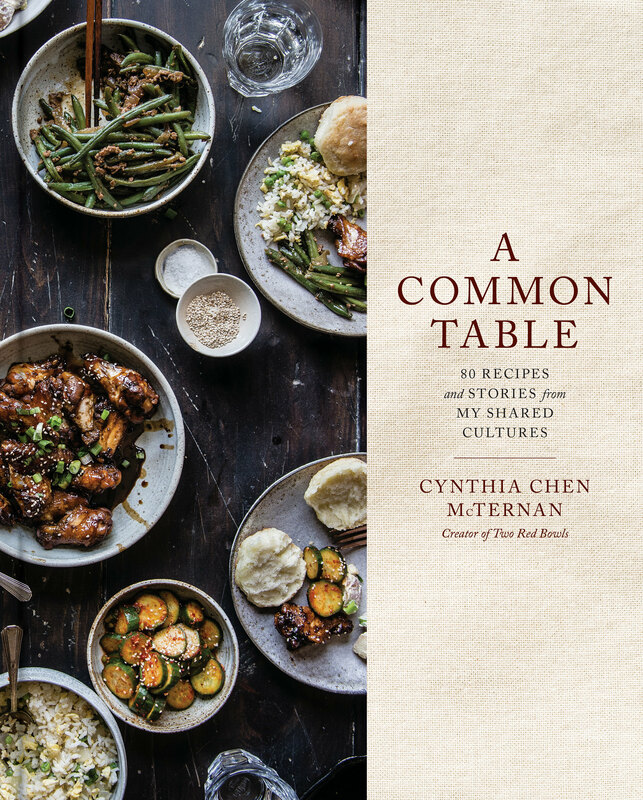 Inspired by various sources and barely adapted from Just a Taste. Leftover mashed potatoes, gravy, turkey, cranberry sauce, the works! Preheat your waffle iron. With a wooden spoon or spatula, fold the eggs into the stuffing until evenly distributed and mixture is moist. The mixture should hold together without crumbs or pieces of bread coming off. If it doesn’t, you can add a bit of chicken stock or water to help moisten it further, a few tablespoons at a time. My stuffing was rich enough that it didn’t need any oil to release from the iron, but you may want to grease the iron for the first waffle, just to be safe. Drop about ½ to ⅔ cup of the mixture onto the hot waffle iron, depending on how large you want your waffle. 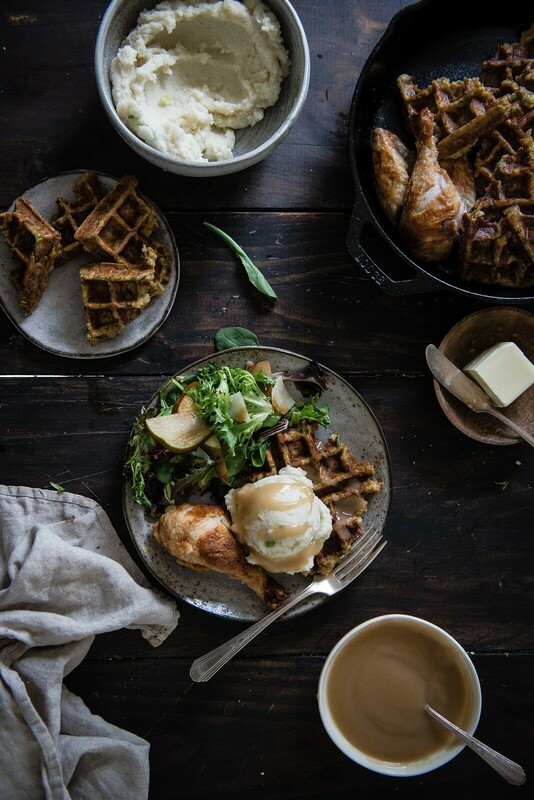 Close the waffle iron and let the waffle cook until dark golden brown and crisp. For me, this took at least 5-7 minutes per waffle. Repeat with remaining stuffing mixture. Finished waffles can be kept in in an ovenproof dish at 250 degrees in the oven, to keep crisp. (It’s also a good opportunity to heat up your other leftovers alongside it!) When done, enjoy hot, with any other leftovers you have -- I love it all! If you don't have a waffle iron, not to worry -- make crispy stuffing cakes! « baby bowl: b-side // his birth story. 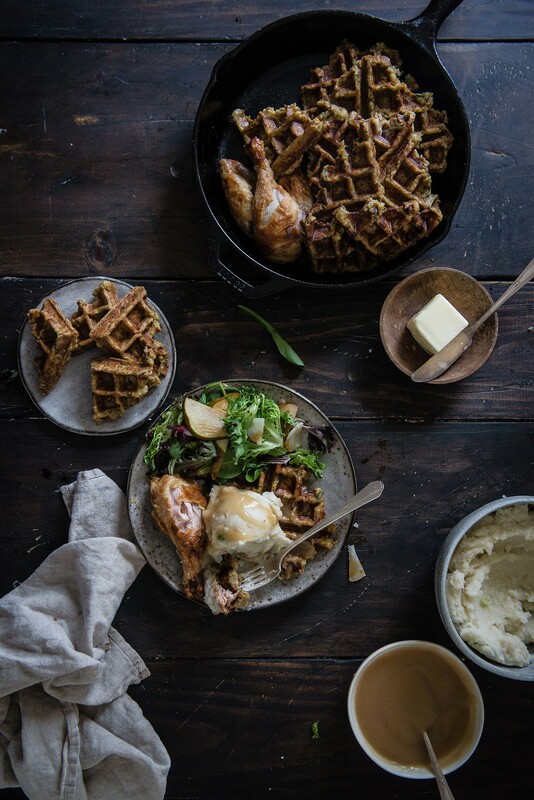 If I end up with any leftover stuffing I’m absolutely breaking out our poor, underutilized waffle iron and making these. Unitasking appliances are kind of the best thing ever 🙂 I’m still always tempted by the hard-boiled egg slicer that I see but would probably use once in a blue moon. 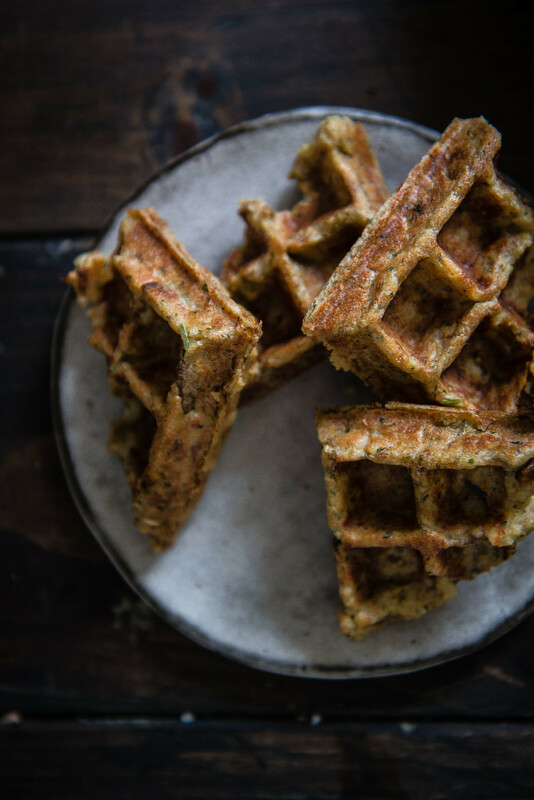 Oh, but I do love these stuffing waffles–tempting, oh so tempting! 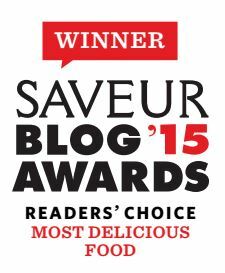 Hmm I wonder if you could use a waffle iron to make bubble and squeak waffles? Now that you’ve made stuffing ones, I’m sure this would work. Oh. My. Goodness. Now I am going to have to double my stuffing recipe just so I can have enough leftovers to make these. This is tempting me to buy a waffle maker, one of the kitchen appliances I don’t have… but with a tiny kitchen and multiple moves in our near future + stacked baking pans (of every size possible and a baked donut pan) + kitchenaid stand mixer and my desire for the new MINI kitchenaid stand mixer “to save space” – i’ll have to see how many eyebrows a waffle maker will raise with my husband.. Baaaah!!! Now I have to unearth my waffle maker – Alton Brown isn’t wrong.. We hardly ever use that thing. But maybe thats because i haven’t been making stuffing waffles!! 😉 So clever!! Haha I agree! Waffle makers are total multi-taskers!! Now I’m kinda sad I didn’t make waffles out of my stuffing and I might just make more stuffing just to make waffles. 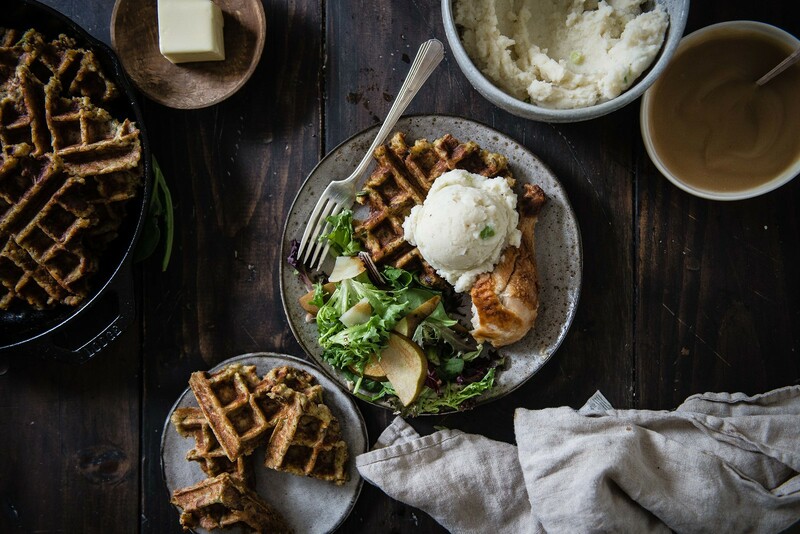 I loved this idea so much, I made stuffing waffles twice right after Thanksgiving – the first one in the regular round waffle iron (a wedding gift in 1969) and the second one in the Belgian waffle iron (had to buy one in 1999), and the better result was from the Belgian waffle iron. I didn’t add the eggs to the stuffing, preferring to top the stuffing waffle with two over-easy eggs and have the yolky goodness moisten the waffle. Very good!